The evidence against tipping is voluminous and damning: it plunges workers into sub-subsistence wages, subjects woman servers to sexual harassment, encourages servers to deliver poor service to people of color (and old, young, and foreign people), incentivizes workers to take actions that harm the business (free drinks for big tippers! ), and covers up a system of widespread criminal wage-fraud that lands disproportionately on the backs of workers who are already poor and marginalized. What's more, in states where the "tipping minimum wage" is abolished (something the restaurant industry goes bananas about any time it's mooted), the food service sector has grown, though the restaurant industry continues to insist that servers are earning $15/hour or more, without any evidence. When asked for evidence, they sent a letter citing their own unsourced statements in other venues: in other words, "Our evidence is we say so." 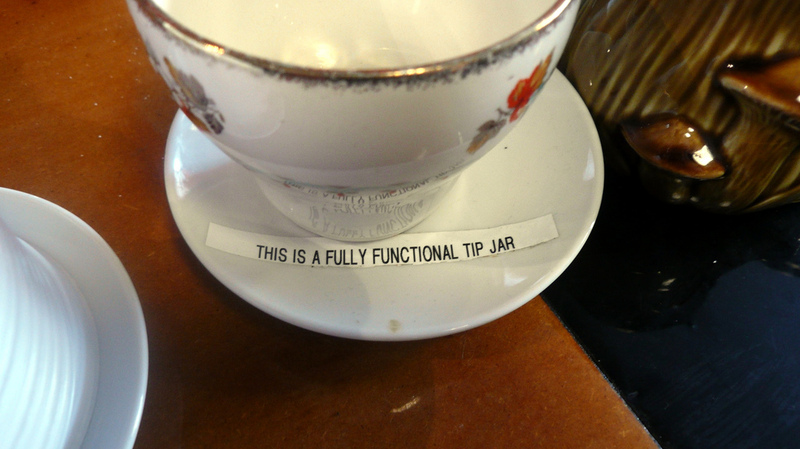 Tipping has a shameful history: it's rooted in racism in post-Civil War America. Today, tipping is part of a new Jim Crow, where black workers earn less from their boss-of-the-hour than white ones. All this is documented in Forked: A New Standard for American Dining, by director of UC Berkeley Food Labor Research Center Saru Jayaraman. The restaurant industry is the second largest and fastest growing industry, and yet the Department of Labor reports every year that seven of the 10 lowest paying jobs are restaurant jobs. And, in fact, of those seven lowest paying jobs in America, four are tipped occupations. So even including tips, restaurant workers make up four of the ten lowest paying jobs in America. There’s this myth, especially if you live in a place like New York or Washington D.C., that what tipped workers make is largely even, that everyone makes what white guys working at fancy steakhouses make. But even in places like New York and D.C., seventy percent of tipped workers are actually women, largely working at casual restaurants, like Applebees, IHOP , and Olive Garden, earning a median wage of $9 an hour when you include tips. These people suffer three times the poverty rate of the rest of the U.S. workforce, use food stamps at double the rate, and, the worst part, suffer from the absolute worst sexual harassment of any industry in the United States. When you’re a woman living on tips—even if you’re making a lot of money on tips, which most women aren’t—you’re subject to the whims of the customer, and really encouraged by management to objectify yourself or subject yourself to objectification to make money in tips. But yes, fundamentally, the problem with the way we tip is that employers, not customers, should have to pay their own workers.